Guanabana is the fruit of Annona muricata, a broadleaf, flowering, evergreen tree. The exact origin is unknown; it is native to the tropical regions of the Americas and is widely propagated. Guanabana is the fruit of Annona muricata, a broadleaf, flowering, evergreen tree. The exact origin is unknown; it is native to the tropical regions of the Americas and is widely propagated. It is in the same genus, Annona, as cherimoya and is in the Annonaceae family. This would-be health advisory informs recipients about the supposedly miraculous cancer killing powers of Guanabana, the fruit of the Graviola tree. Soursop Fruit - 2 Lb to 3 Lb. 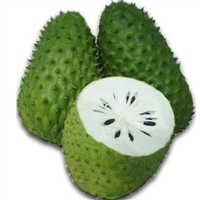 Soursop Fruit - Store Pick Up - 10 Lbs. Soursop Fruit - Store Pick Up - 20 Lbs. © Copyright 20XX Exotic Fruit Market. All Rights Reserved.